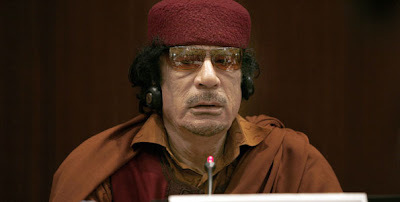 With the election of Libyan leader leader Muammar Gaddafi as the chairman of the African Union, the continent is in for a very explosive period. For one, Africa finally has a chairman who says that coups are welcome so long as they are staged peacefully. Col Gaddafi, who rules under the Jamahiriya “mass-state” system, said the post-election violence in Kenya early last year was a sign that democracy cannot work in Africa. The signs are that Africa is in for a very tumultuous time under the guardianship of Col Gaddafi. In power since a 1969 coup against Libyan monarchy then led by King Idris I, Gaddafi is currently the fifth longest serving head of state. He is also the longest serving head of government worldwide. The year 2009 has come with its surprises. For the first time, the former leader of a group listed as terrorist is now a fully recognised under the AU charter as a president. He is none other than Sheikh Sharif Ahmed who had been chairman of Somalia’s Islamic Courts Union in the early stages. The Islamists were chased out of Mogadishu by Ethiopian forces in 2006. This year, by early July, the continent is to finalise plans for a single government with a president and vice-president and its own ministers covering various portfolios such as education, foreign affairs health and defence. The other issues being pushed by Africa is the continent’s desire to join the UN Security Council. Africa contends that in 1945 when the UN was being formed, most of Africa was not represented and that when in 1963, the first reform of the UN took place, Africa was represented but was in a particularly weak position. This is also the year when Africa must decide when it is to hold its “Diaspora Summit’’ more so now that the US now has a president, Mr Barack Obama, who traces his roots to Africa. The Diaspora summit will bring together delegates from all over the world but, since AU leaders are loathe to the criticism they will face for their failed policies, they have been reluctant to call this meeting. At the same time, the AU is preparing for the “Africa Women’s Decade’’ to run from 2010 to 2020 and putting in place its argument against what it calls “abuse of Principles of Universal Jurisdiction,’’ under which Africans have been charged in Europe, among them Rwanda’s Rose Kabuye. This is the perfect time for Col Gaddafi to take the reins of leadership. He can push his agenda. There are actually very few leaders who can challenge him. In the past, South Africa’s Thabo Mbeki could challenge Gaddafi at AU meetings but he is no longer in office and his replacement, Kgalema Motlanthe is an acting president who is due to hand over to his mentor Jacob Zuma at elections set for mid this year. On the other hand, Africa’s most populous state, Nigeria, has a president who is perennially sick and who was on holiday as the AU met in Addis. Umaru Musa Yar’Adua instead sent his vice-president Mr Goodluck Jonathan, a man who cannot challenge Gaddafi. In the past, retired general Olusegun Obasanjo was a man Gaddafi could not ignore but his presidency ended in 2007. What happened in Addis is that many heads of state simply did not show up because they did not want to commit to Gaddafi’s grand project of a single government for Africa. But, there was one leader for whom going to Addis was out of the question after an attempt on his life during a past AU summit. That is none other than Egyptian president Hosni Mubarak, a man who has been in power for 28 years. Currently, many African leaders are very fresh off the ballot box or off the barracks and the ones who have been in office for long have too many problems. Take the case of Sudan’s Omar al-Bashir. True, he has been in office since 1989, but the indictment planned against him by the International Criminal Court (ICC) over the Darfur conflict leaves him very little breathing space. In fact in Addis, there was talk that the AU would recall its support for Bashir over the indictments but this did not take place. But, the fact is Africa is at a turning point. It is like 1963, the year the defunct Organisation of African Unity was formed. At that time, the man calling the shots was Ethiopian Emperor Haile Selassie. But even at that time, there was a group of African states that wanted the continent to unite under a federation. This idea was pushed by Ghana’s leader Kwame Nkrumah and the countries supporting him were: Libya, Algeria, Guinea, Morocco, Egypt and Mali. Those against were led by Leopold Sedar Senghor of Senegal. This group comprised Nigeria, Liberia and Ethiopia. Just as in 1963, there is a major split between those leaders who want the single government created now and those who want a gradual move to a continental government. Currently those for immediate federation are: Egypt, Senegal and Libya. Those who want a gradual move to a continental government are: South Africa, Ghana, Uganda, Zimbabwe and Kenya. Ethiopia as host of AU has taken a middle ground saying it supports the plan but wants an orderly transition. The "gradualists” are led by Ugandan President Yoweri Museveni while the “immediatists” are led by Colonel Gaddafi. The “immediatists” are already one step ahead since the Addis summit agreed to create African Union Authority that will function like a government. What remains currently is reform of the AU constitution to embrace this new arrangement under which the continent is to have a president and vice-president plus secretaries to run African affairs. The question here is the deadlines set which may not be achievable. The Addis summit mandated its Foreign Ministers to meet within three months to work out the transition from the current African Union Commission to the Authority. The council of ministers is to hand its resolutions to the next AU heads of state summit set for July 1-3 in Antananarivo, Madagascar. But this may not happen as Madagascar is currently under an uprising against the rule of President Marc Ravalomanana with over 100 protesters killed. Picking Madagascar as the host means that the AU will take the next available option which is Tripoli, right in the heart of the Gaddafi Empire. The question now is how much power the states that comprise the AU are ready to cede to the new body to be created in July.